What a pretty post! I love white chocolate and those chocolate treats look amazing! Your tulips are lovely as is the chintz teapot but I am loving your robin egg blue teacup or is it light blue? In any case it is a scrumptious teacup! I'm glad you had a lovely Easter with your family. So did I. Have a wonderful week, my friend. It's funny Terri that I am drinking hot tea as I read your post. Yes, Easter was wonderful. I love your tea cup and all you photos are beautiful. My favorite Easter candy are the malted milk eggs like in you photo. I had to buy a bag! The robin egg blue teacup is lovely as is the chintz tea pot. I love those eggs in the tea cup. They're my favourite. Your variety of cupcakes looks scrumptious. Now that I've seen those delicacies, I'm hungry but it's too late to eat. It's after eleven and it's bedtime. Tomorrow I will buy something scrumptious at the bakery counter and treat myself. I'm so skinny that I can afford to do it. That's a gorgeous teacup. And, those tulips...wow! So pretty! Hi Terri. Such a pretty setting. And your tulips are lovely! I know you had a blessed Easter, my friend! Thanks for hosting! I thoughtto you hen I found the pretty suggar and milk pots on last sunday! But there was no teacup like them! Those tulips are just gorgeous!!!! Your photos say Easter in every way, such prettiness, and beauty, and expression of joy Terri! I love your beautiful Easter vignettes and those tulips are gorgeous. So happy to hear that you had a wonderful Easter. Your tea looks gorgeous! I love those little eggs spilling out of that precious tea cup. PS - I'm having a giveaway on my blog in case you want to check it out. Oh Terri, what a beautiful Easter you must have had. Your photos are just lovely! Love the color theme. You are using your favourite color. 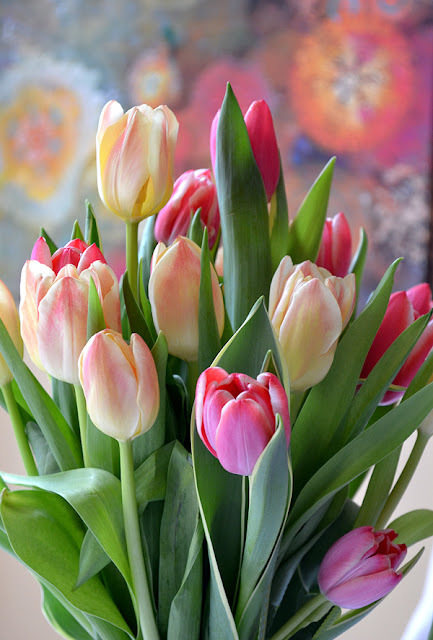 Love tulips always as the flower of spring. Beautiful post....it's all sooooo very pretty! your cup of tea is so beautiful! i love it so much! Absolutely gorgeous tablescape. A perfect celebration of Spring. Thank you for sharing I love love love this post did I say I love this Post! I've been out of touch from Blogland for a while. Just loved coming here and getting caught up on your latest posts. Just love your pretty Easter pictures here. and oh those new tulips almost "screams" of energy of the beautiful kind! Hugs and happy April, dear Terri. What a lovely, lovely, post! Hi Terri..I absolutely adore that gorgeous rabbit and aqua pot..my fave color scheme today..and the blue cup....wowness...blissful...I love anything in those dazzling aqua blue turquoise colors! What a magical post..so festive and charming! This Easter I received a box full of old cups from a Great Aunt, so I can't wait to share some here soon! Blessings to you sweet friend..Happy Easter and here's to a magical Spring! PS; sorry if I leave two comments, my first visit today it didn't work, so not sure if it went through! Hi Terri, Thank you so much, I did have a lovely weekend; a sunny break in the Vancouver rain. :) I love the look of your chocolates...mmm...I'm so craving chocolate now...lol. The tea cup is beautiful. I love it when tea cups have such rich decorations on the inside of the cup. Then I almost don't want to add milk. Almost. I hope you have a lovely week. Hugs. Always so special to stop by for a visit dear Terri! 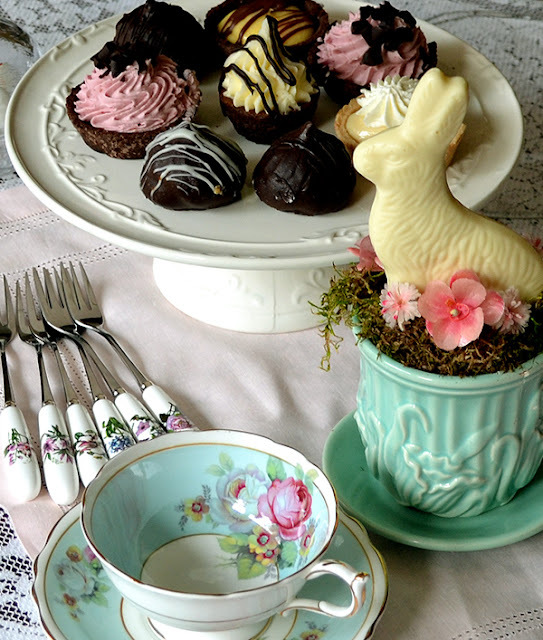 Absolutely GORGEOUS post, Terri- you have set the most beautiful Easter teatime. 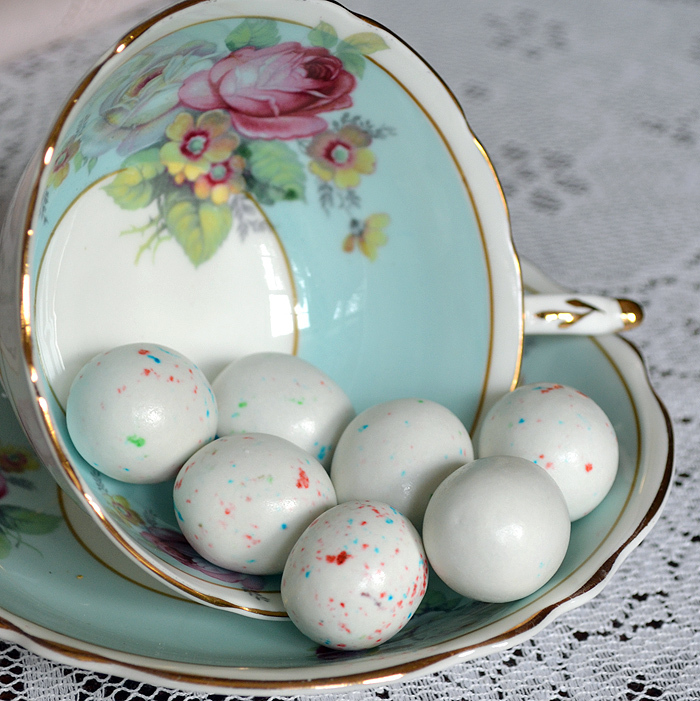 I love the way your malted milk eggs look in that pretty foral aqua teacup. Glad you had a wonderful Easter!! Hello Terri. I hope you had a wonderful Easter. My was perfect. I love your lovely post. The chocolates are calling my name. The tea cups are stunning as always. So many pretty pictures to pour over, and such a gorgeous tea cup. We've been having a cold snap in our area, so looking at your post was like a breath of spring. Lovely! each of your pictures is worth to make greeting cards from it. I love especially the one with the Chintz tea pot. It so gorgeous with your pretty tea cup. The cupcakes look very tempting, too. Thank you for this marvellous Tea time and for hosting this sweet event. What a gorgeous collection of beautiful and delctable objects and the photograpfs themseves are amazing. They have made me feel so joyful. 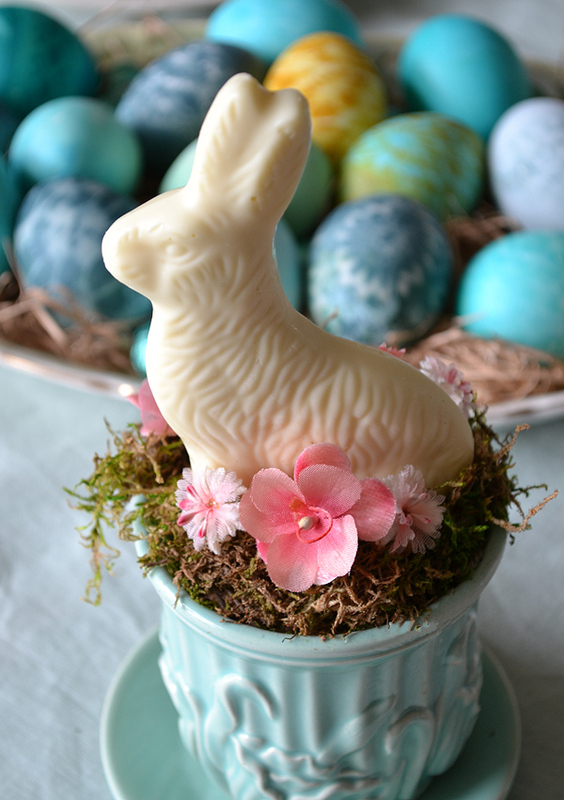 The Easter treats are beautiful...the teal teacup I'm drooling over. Visiting you is such joy! O my Terri, I love the beautiful tea cup and the chintz tea pot..It reminds me of the one I used to see years ago in the Victoria magazine..but never could afford at the time...I had a wonderful Easter too..with love Janice p.s. I really love the colors of the tea cup..!!! Such a gorgeous post Terri! I just adore your little bunny in the teacup. Wishing you a great weekend. Thank you for hosting. I just love that tea cup!!! Happy Easter, Happy Spring!!! That was a lovely Easter vignette! I love that yellow chintz tea pot and I adore the blue planter that bunny is sitting in!! such a beautiful post, ans I missed it! I hope spring has startedfor you as well, Yesterday we had snow, but today was a lovely sunny day! what a beautiful post and the photos are gorgeous. Anyway, I invite you to visit my blog! I am a antique teacups collector and love to make creative tablescapes!